Sandakan is a coastal town in the Sabah region on the Malaysia side of Borneo Island. 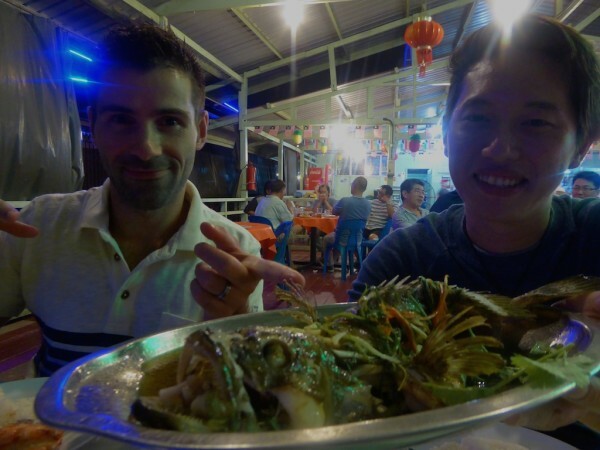 We spent a few nights in Sandakan as a base for exploring some of the gems of Sabah and discovered an exciting small city, with a plethora of great seafood! During the colonial times in the nineteenth century, it was the capital of British North Borneo and a strategic commercial and trading centre. Japan occupied the area during the Second World War and was completely destroyed by Allied bombings. 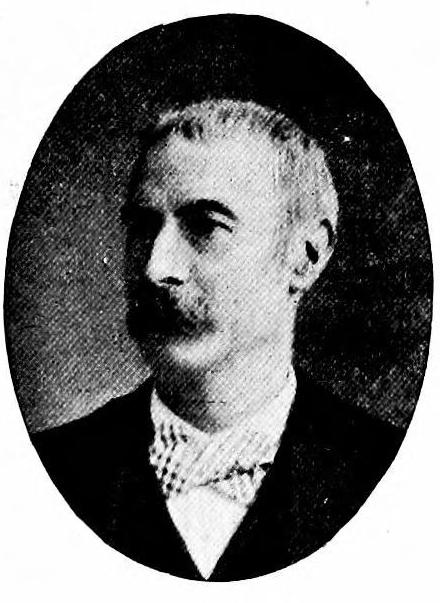 The British got it back after the war and developed the fishing industry as part of the Reconstruction and Development Plan. Hence the excellent seafood reputation! WHERE TO STAY IN SANDAKAN? There’s a variety of decent places to stay in the area, but our favourite was the Four Points by Sheraton, a well known landmark and the only international brand. It is located right in the heart of the city, overlooking the sea and only 20 minutes away from the airport. 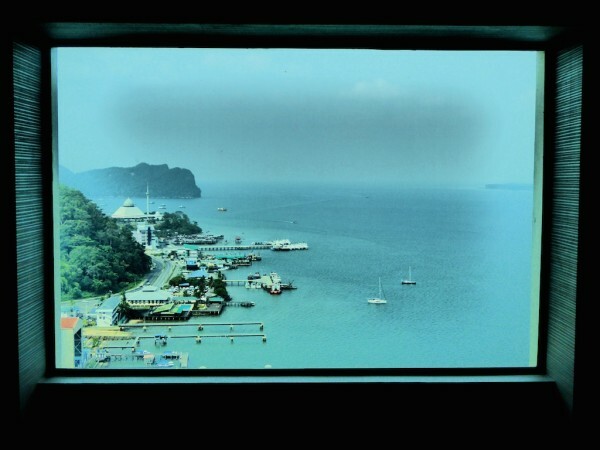 The view from our window across the Sandakan Bay was a great way to start the day. We also enjoyed staying at Four Points because of the 24 hours gym and swimming pool facilities, as well as the excellent buffet breakfast. Prices for rooms at the Four Points by Sheraton start from 195 Ringgits (£30/$46) a night. Check prices now. 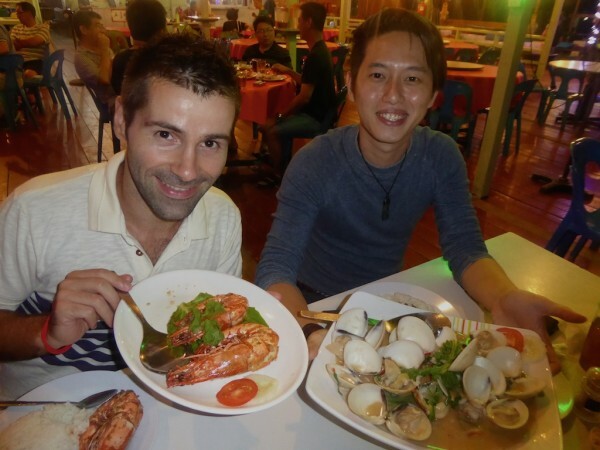 WHERE TO EAT IN SANDAKAN? Sandakan is well known for having some of the tastiest seafood in Sabah and the Sim Sim Seafood restaurant one of the best places for it. It’s a short taxi ride away from the centre and serves up some of the tastiest fresh seafood we’ve ever had. We recommend their soy sauce steamed groupers. You pick the grouper fish when it’s still alive and it's then cooked and served immediately. THAT'S how fresh it is! The Best Brew Pub at The Four Points is the only place with a live band. It has some great western food like caesar salad, burgers and beef ribs, with an incredible view of the sunset over the bay. Our favourite dessert in Sandakan was the popular UFO cake, which you can only find here. It’s a meringue-like custard tart with a caramel flavour. Check out any of the small eateries in the downtown area for these yummy prizes. 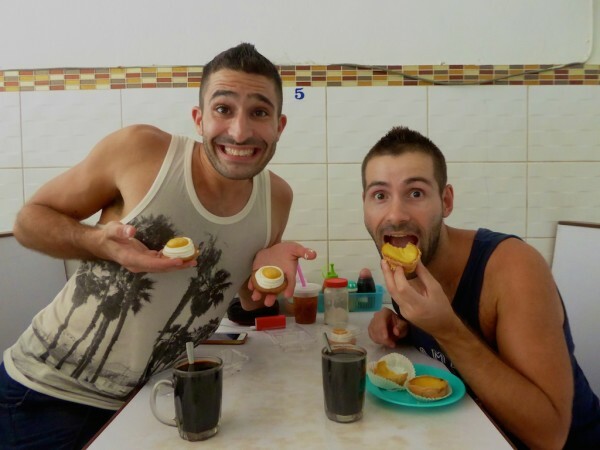 UFO fun in Sandakan – boy did we love these little desserts! Another local dessert we enjoyed in Sandakan are peanut pancakes, which you can find in the local markets. They are in fact made using actual peanuts as opposed to peanut butter and taste gooooood! 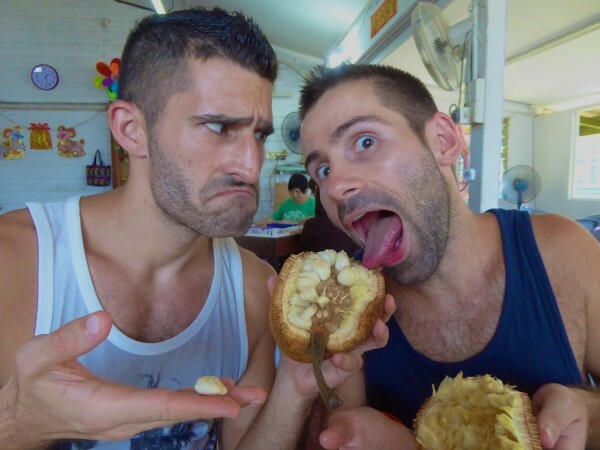 Our foodie adventures in Sandakan also led to a new fruit discovery: the tarap. Tarap is a fruit you can only find on Borneo Island because they are too fragile to export. They look a little bit like a smaller durian on the outside, but the taste (and smell) once opened is totally different. Tarap are more like a mild jackfruit, with a creamy flavour. The pool at The Four Points was one of the best infinity pools we’ve encountered. It is high up and west facing, offering some of the best sunset views across the Sandakan Bay. It costs 50 Ringgits (£8/$12) for walk in guests to use the pool, which includes 1 drink. The Sandakan Heritage Trail is a comprehensive walk through the main historical sites of Sandakan, like the 100 years old Masjid Jamek mosque, the Pryer Memorial statue honouring William Pryer, the founder of Sandakan, restored colonial buildings like the Agnus Keith House, and many more. The Puu Jih Shih temple is one of the finest Chinese temples in Sabah. It was undergoing renovation when we visited in August 2015, but still had a calm and serene atmosphere. 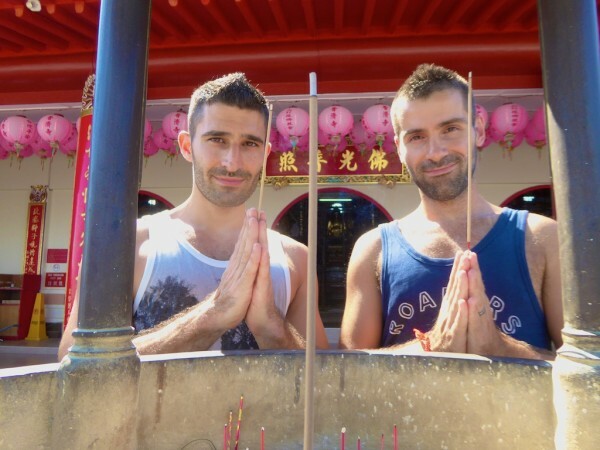 It's located on top of a hill, so even if you have temple fatigue, it's worth visiting just for the views. If you’re in the city during October, check out the annual Run To Give Marathon hosted by Four Points. It’s an excellent charity initiative to raise awareness for breast cancer and funds go to the Sandakan Kinabalu Pink Ribbon. 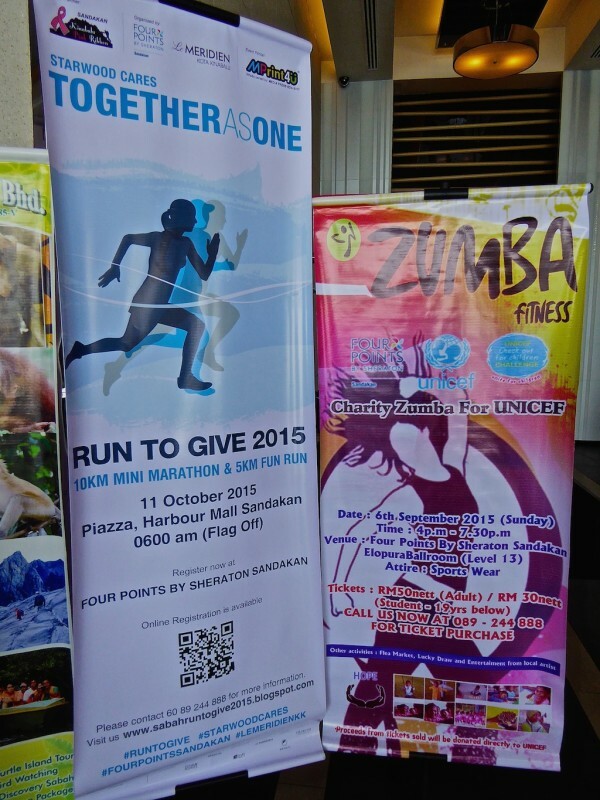 This year’s event is on 11 October, featuring 5km and 10km runs. The Sun Bear Conservation Centre is where these very cute small bears are rescued from appalling conditions and treated so they are ready to return to the forest one day. They are the smallest bears known to man and nicknamed honey bears because they love honey so much. This is similar to Sebastien's nickname of Pooh Bear because he's always caught red handed with his face stuck to an empty pot of honey. 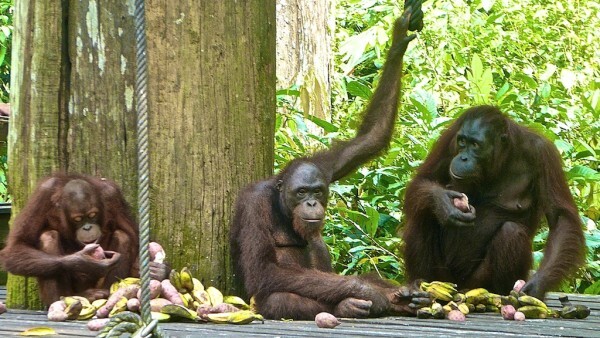 The Orang-Utan Rehabilitation Centre is a non for profit organisation dedicated to the conservation of wild orang utans and their rainforest habitat. They rescue orang utans which have suffered, been separated from their mothers or lost their home due to deforestation. Like the sun bear centre, they are taught the skills they need to survive in the wild, then released when ready. Orang utans are native to Borneo island and the two words, orang utan, literally mean “persons of the forest”. They have 98% same DNA as humans: watching them interact whilst eating was astonishing to see how similar they are to us. The Rainforest Discovery Centre is excellent for bird watching, with more than 250 species sighted. If you're here in August, look out for the annual Rhythms of Rimba Festival, organised by Future Alam Borneo. 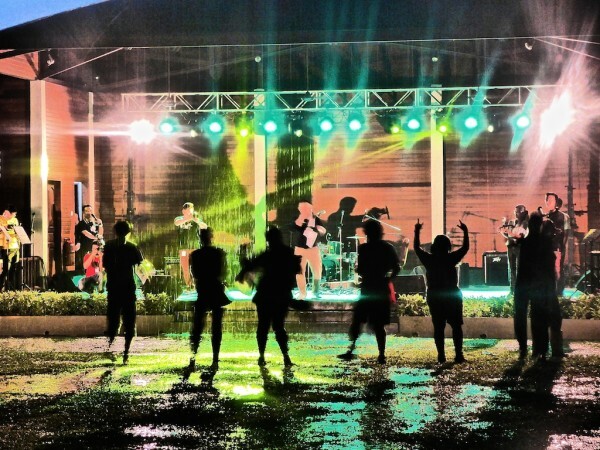 We attended and had an awesome time enjoying great music in a rainforest environment, complete with the intermittent tropical rain. Yes Ufo Tart or our people call Sandakan Ufo Tart is the famous dessert in Sandakan. Thanks visit our beautiful Sandakan. ? Sign me up for “UFO” desserts – that sounds absolutely delicious! The more I eat Malaysian food, the more I fall in love. 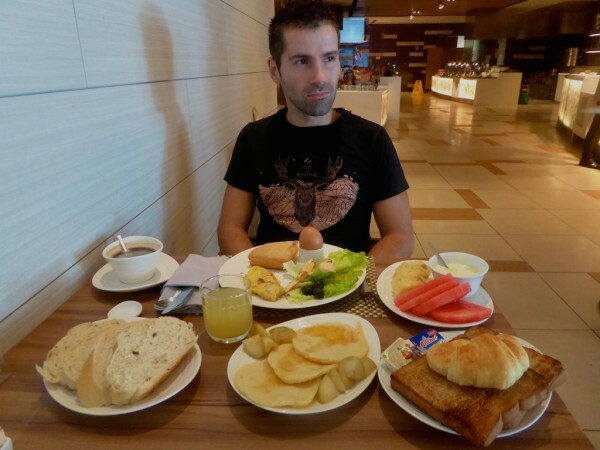 PS – That breakfast looks nuts! Hello boys! Actually I had never heard of Sandakan, strange right? Since I live in Singapore! But now I know where to go to visit the orang utan rescue Center. As always you look like you had a lot of yum! These ufo cakes looked awesome ? Oh god the palm oil industry is disgusting! But then checking everything that has palm oil in it we felt like complete hypocrites! I guess I’ll need to go there as if only to taste tarap fruit – I love trying new fruit and dishes, and as it cannot be exported, then I’ll need to go…. So need to go to Malaysia now!!! ! First of all: I really have to go to Malaysia just because of the food. It looks so delicious! 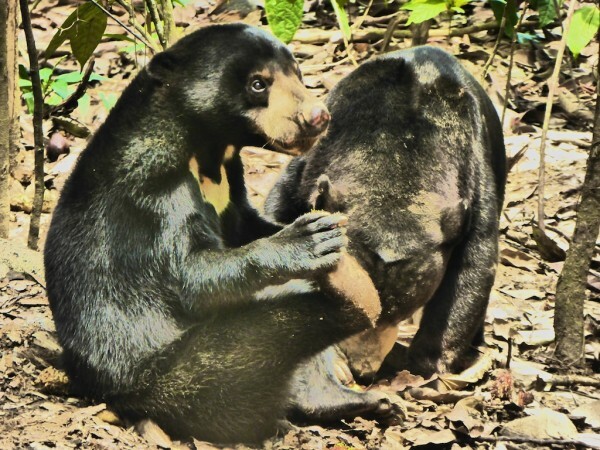 The second reason I would want to go there is the Sun Bear Conservation Centre, that’s sounds like a great place to go, and I mean, how cute are those bears?! Right? They’re so adorable 🙂 Malaysia is a paradise for foodies. Packing my bag right now! I would love to see those gorgeous orangutans and, of course, that infinity pool — and the food! I’m drooling already! I’ve been dying to go to Borneo for many years. 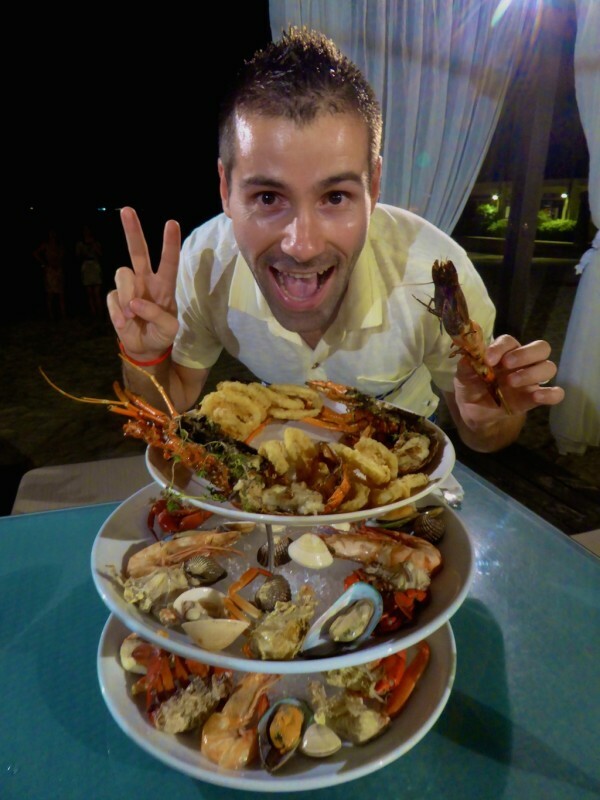 Have thought of Borneo only for the animals, but good to have some ideas about the food too! Looks like you boys had a great trip. Hey, didn’t know much about Sabah until this. They have the orangutans there, I would love to see that. 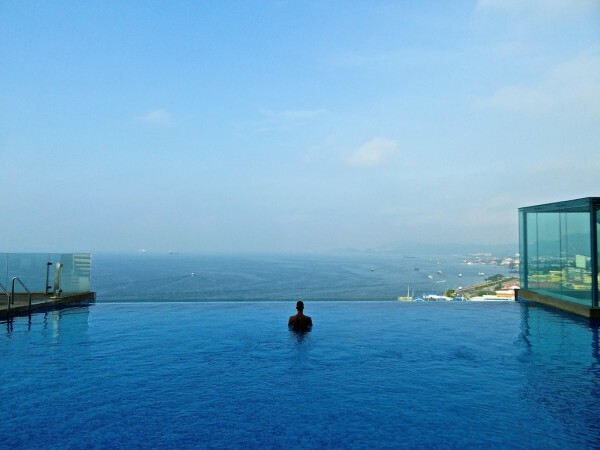 Oh, and by the way… I so love that infinity pool.